The U.S. presidential race is heating up, but you can cool tempers with a nice batch of cupcakes urging people to get out and vote. Also suitable for class elections, local primaries and so on. 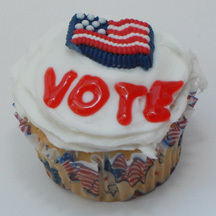 Remember, everyone loves cupcakes–they’re nonpartisan. What You Need: 1 cupcake; white icing; red gel writing icing; premade American flag cake decoration (such as by Cake Mate or Wilton). How to Make It: Frost cupcake. Use writing gel to write “VOTE” in red. Or, write a candidate’s name. (You could also use writing icing in a tube or pastry bag). Add flag decoration. This entry was posted on Saturday, September 13th, 2008 at 10:23 pm	and is filed under Fourth of July patriotic cupcakes. You can follow any responses to this entry through the RSS 2.0 feed. Responses are currently closed, but you can trackback from your own site.